Lilies have been grown in gardens all over the world for more than three centuries -- their beautiful, dependable blooms adding color and elegance to landscapes reliably. While their ornate blooms trick many people into thinking they are fussy to grow, they are actually quite the opposite. By heeding the following tips you can grow a range of lilies in a variety of soil and light conditions, providing blooms throughout the growing season. It's important to plant your bulbs as soon as possible after getting them. Lilies lack the paper covering that some other more hardy bulbs have, making them susceptible to drying out if they aren't planted right away. If you can't get them in the ground right away store them briefly in a cool, dark space. Unsure about exactly how to plant your lilies? Then check out B&D Lilies for some great advice. Lilies, more so than any other bulbs, do not like to sit in wet soil. Prolonged exposure to moisture can cause the bulbs to rot and die. Before planting add well-decomposed compost or other organic matter to increase the drainage capacity of the soil. It's not necessary to add fertilizer to the soil when planting lily bulbs. They will take off and grow without this extra food. When the green leaves begin to poke up through the soil surface, sprinkle a light all-purpose fertilizer around the plant and water it in well. This will give them enough nutrients for the growing season. Plants will do best when they receive about 1" of water weekly during their active growing season. Too much moisture can cause the bulbs to rot. A light layer of mulch on the soil surface will help to keep bulbs from drying out too much between waterings. As your lilies bloom, feel free to cut flowers for indoor arrangements as you wish. Try to not remove more than one-third of the stem when cutting flowers as this can reduce the plant's vigor and longevity. After your lilies stop blooming for the season you want to let the green foliage continue to grow as long as possible. The leaves will continue to use the sunlight for photosynthesis and strengthen the bulbs for the winter and following growing season. Continue to water lightly as long as the leaves are green. Towards the end of the growing season, the foliage will begin to yellow and droop as the plants go into their dormant cycle. At this time, cut the foliage back to the soil surface in preparation for winter. If you live in an area with cold winter it's important to cover the planting beds with a layer of mulch such as straw or pine boughs. This will help to protect them from the cycle of freezing and thawing that occurs and keep the bulbs from drying out too much. 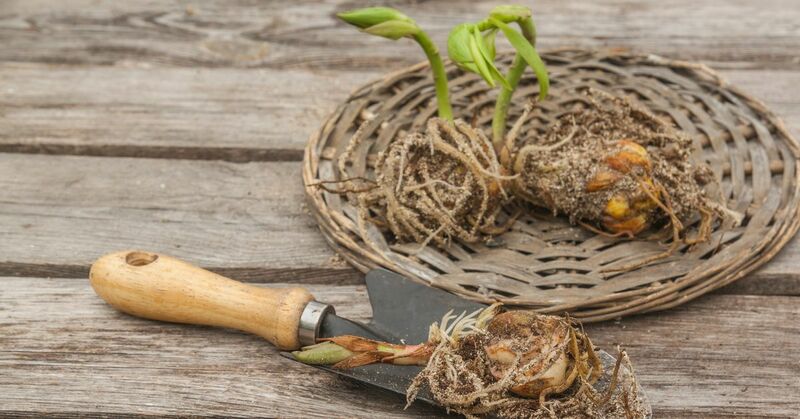 Over time your clump of planted bulbs will become quick thick. To keep the plants growing well, periodically divide them to give them adequate space. Gardening Know How walks you through the steps of how to divide your plants and when is the best time to do so.